first post of the year — and it’s only almost may! Posted on April 23, 2005 at 2:03 am. most recently i’ve been to new zealand and the united states. 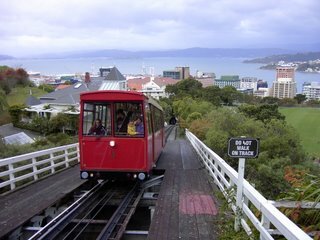 wellington, nz really impressed me, with a compact and negotiable central business district and a perfect range of activities for 20- and 30-somethings: good food and bars, natural terrain featuring a harbor surrounded by hills and low mountains (for you sailing/hiking/camping types), many non-traditional and locally-owned shops, the national museums, library and galleries, good public transport (like the cable car, offering spectacular views of the city), and most important of all- an impressive selection of BELGIAN BEERS available in the grocery stores. so of course i had a fantastic time in wellington. i think if i ever had the chance to live in new zealand, which i would love to do, wellington would be my first choice. not the destination for those of you that like beaches and sunny weather, however. in the states, i spent the entire time with seréne, my lovely companion in this world. she lives in nashville,tennessee, but while i was there we visited my parents in florida and friends in indiana. florida is almost the exact opposite of wellington — sunny days, beaches everywhere, very touristy. still, even that’s fun to do every so often. and so much has happened in this crazy world i can’t even begin to get into it. maybe next time.